The United States is considering sanctions that would strike at the only source of cash for troubled Venezuela: Oil. Two senior administration officials told CNN that sanctions could be announced as early as Monday. The Venezuelan government on Sunday held a controversial vote that President Trump and many other critics say will erode any last signs of democracy in the South American nation. One option is a possible ban on sales of U.S. crude and refined products. The harshest of sanctions, an embargo on shipments of Venezuelan oil to the U.S., is off the table for now, one source said. Venezuelan President Nicolás Maduro "dreams of becoming a dictator," Trump said in a statement on July 17. 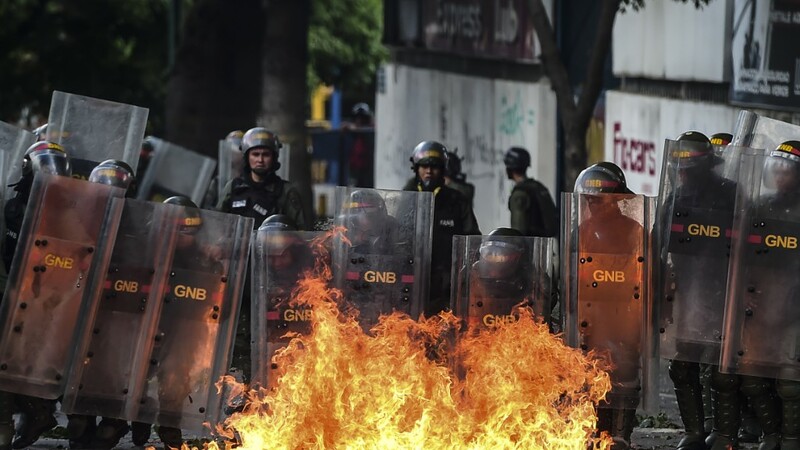 "The United States will not stand by as Venezuela crumbles." For his part, Maduro called Trump an "emperor" this week. "United States condemns the elections" and said they were "designed to replace the legitimately elected National Assembly and undermine the Venezuelan people's right to self-determination." The Trump administration on Wednesday slapped sanctions on 13 government and military officials tied to Maduro. Mexico and Colombia followed with sanctions on the same individuals. Trump threatened further "strong and swift economic action" after Sunday's vote. The U.S. sends light crude oil to Venezuela, which has heavy crude. The two get mixed together in Venezuela and shipped back to the United States. Still, the possibility of sanctions isn't lost on Venezuela's young protesters in Caracas known as "La Resistencia" who go up against Maduro's national guard in violent clashes nearly every day. One protester, an engineer who declined to give his name, told CNN Wednesday "in a way, it would help us," arguing that U.S. sanctions would force Maduro to change his ways or step down. But sanctions on oil are a double-edged sword: It's one of Trump's few options to really hurt Maduro. Venezuela's only source of income is oil sold abroad and one of its top customers is the United States. In April, the U.S. accounted for about 10% of Venezuela's oil exports. "If they ever got sanctions from the U.S. -- that would be completely crippling," says Diego Ferro, co-investment officer at Greylock Capital, a U.S. firm that owns Venezuelan debt. Choking off the country's lone source of income, however, risks worsening Venezuela's humanitarian crisis. Millions of people continue to suffer through extreme shortages of food and medicine there. Another risk: U.S. gas prices could rise. Venezuela sends cheap oil to U.S. energy firms, and oil sanctions would force the U.S. to buy oil elsewhere. For now though, that type of sanction seems less likely than a ban on U.S. oil exports to Venezuela. "Nobody wants to be the guy that raises gas prices, that's not good for elected people," says Russ Dallen, managing partner of Caracas Capital, a U.S. investing firm that doesn't own Venezuelan debt. U.S. sanctions could also embolden Maduro's base, igniting them to double down on their heavy-handed tactics against Venezuela's opposition protesters. Venezuela exported the third most oil to the U.S. so far this year, behind Saudi Arabia and Canada, according to data from the U.S. Energy Information Administration. Its oil exports to the U.S. totaled $10.2 billion in the year ending in May, according to Panjiva, a global trade research firm. Given all the risks, some doubt Trump would actually go forward with a broad sanction on Venezuelan oil. "Once you deploy a sanction, there can be unintended consequences," says Eric Farnsworth, vice president at the Council of the Americas, a business association. "I'm not convinced they're going to move forward to sanction the energy sector." Elise Labott reported from Washington. Patrick Gillespie reported from Caracas.